This holiday classic and audience favorite returns for its 18th consecutive year. 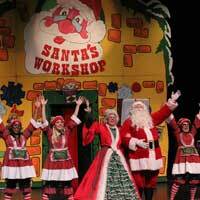 Our biggest and most colorful show will put children and adults alike in the holiday spirit. Join Mrs. Claus as she teams up with the new Elf Class of 2016 to find Santa’s missing list in time for Christmas. Can Mrs. Claus and the elves save the holidays? All CKC shows feature plenty of audience participation and run for one hour with no intermission. Mrs. Claus! A Holiday Musical is targeted for children from 2 to 8 years old.